The next installment of the adventures of Aunt Jane and Ian in the UK. Given that the preceding day was very long and very active, Wednesday, our fourth full day in England, got off to a late-ish start. The scheduled highlight of the day was a walking tour of historic London pubs (thanks, again, Viator.com). The meeting point was 2 pm at London Bridge Station (this is significant later in the story). I planned that our morning activity would be to visit the Tower of London, built by William the Conqueror, home of the crown jewels, former palace to kings, site of executions and prison to many famous criminals. It even housed its own zoo of exotic animals, including an ice skating elephant. Ian and I originally planned to travel there by boat, but since we got a bit of a late start, we made a quick trip to our neighborhood Starbucks (built by Charles II, I think) and hopped on the Tube to Tower Hill. Although it was crowded, we walked right into the Tower and our journey to historic London began, first to the original palace and then through some of the cells where prisoners were kept. Eventually, we made our way to the crown jewels, which were very impressive. I also have to compliment the people who designed the exhibit for installing moving sidewalks in front of the jewels, so that no one can lollygag or linger. Brilliant. Move ’em in, and move ’em out. Our final stop was the infamous White Tower, which is in the center of the fortress. Once a palace for kings, it later became a prison for high profile criminals and the scene of some of history’s most famous executions (Anne Boleyn) and public flayings and disembowelments. We were primed to see some implements of real nastiness. However, this aspect of the Tower’s history was downplayed in the exhibit hall. We saw an enormous display of armour, spears, and other artifacts. But only one display featuring an ax and the chopping block. 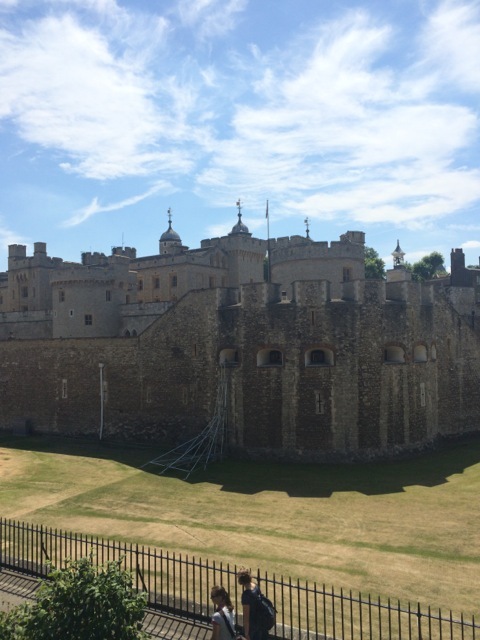 Did you know the Tower of London once served as the Royal Mint? We didn’t, and guess what? We didn’t care. We were “let down” or as we say in American, feeling completely “ripped off” by the lack of historical blood and gore. After all, the sign outside the entrance referred to the White Tower as the “Bloody Tower”. I don’t think they delivered what was promised. Good advertising makes a bad product worse. As it was getting close to the time to meet our Pub Tour group, we cut our losses and exited the Tower on the Thames side, close to the Tower Bridge. Don’t get me wrong, we enjoyed our visit to the Tower, but we were looking forward to a little historical savagery. Given how many little children were around, I guess it would have been inappropriate. Anyway, it’s at this point that I pointed out to Ian that many people think that nearby Tower Bridge is actually London Bridge, but it’s not. This will also prove to be significant in just a few moments. We meandered back to the Tower Hill tube stop and I couldn’t figure out why I couldn’t find the Tower Bridge Rail Station. After a lot of frantic wandering. a kindly railworker finally set us straight. There is no Tower Bridge Rail Station (insert: Aunt Jane, you dumb a$$); we had literally two minutes to take the tube one stop east, then change for the Northern line to get to the LONDON BRIDGE RAIL STATION stop to meet our tour. I looked at Ian and he looked at me, and he said “We can do it.” And we ran. It’s kind of a blur to me now. Through turnstiles, down passage ways, up escalators, down staircases. We got there, but we were 10 minutes late and the group had departed. We’d come this far, though and I was not giving up. I called the tour company. Dead end: answering machine. Then I remembered that the tour description mentioned the first pub stop on the tour. I whipped out my iPhone (I still had it then — more on that later), and read the tour summary. It said something about the first stop being London’s only surviving coaching inn, but no name. 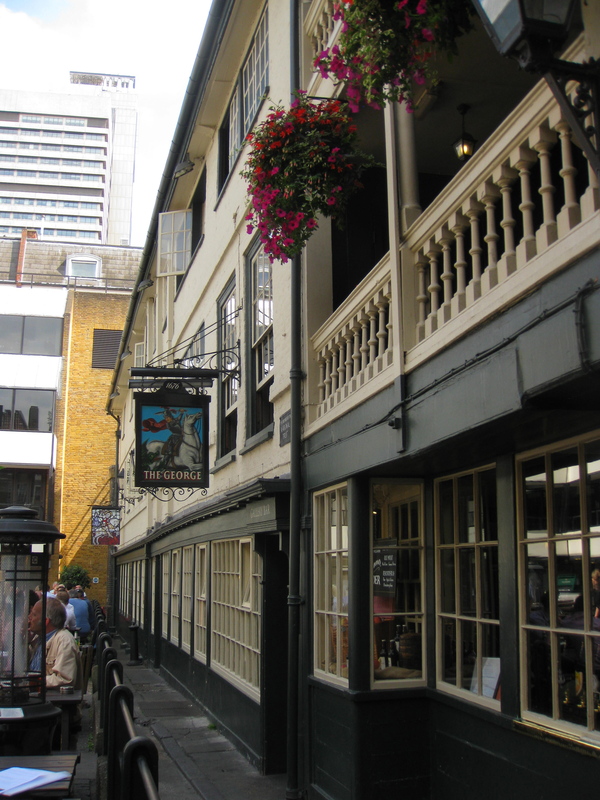 But I also had an app of the best pubs in London, so I quickly looked up the closest pub around me and sure enough, The George, was listed and described as London’s only remaining galleried coaching inn. Bam! Google maps and Ian navigated us there and we met up with our tour. For the next four hours, we were guided around London, visiting historic pubs, such as The Blackfriar, which coincidentally is very close to the J.P. Morgan office in London. I actually spied one of my colleagues having a pint there which was so odd since it was before 4 pm. 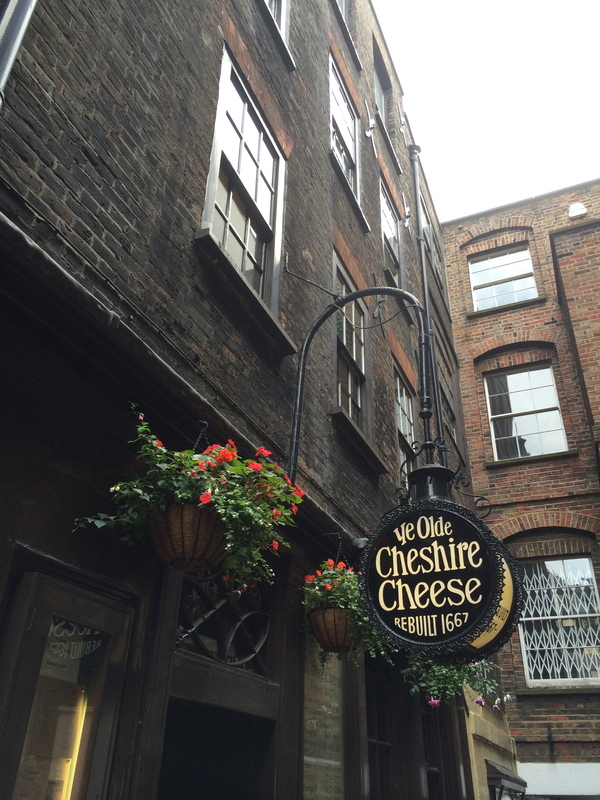 Another stop was Ye Olde Cheshire Cheese, one of Dicken’s haunts. We ended tour the at the Princess Louise, a beautiful Victorian pub. 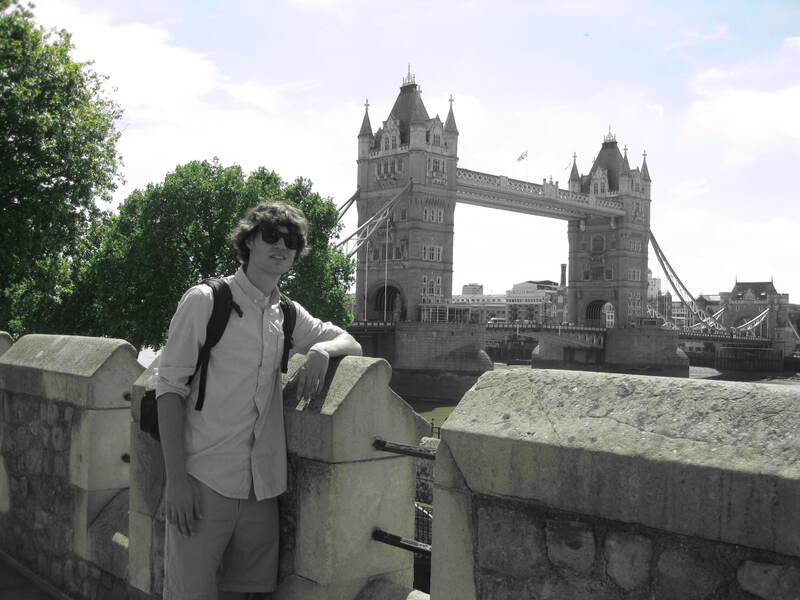 The tour was really a great way to see London. After resting up at our flat, we decided to return to Central London, and found ourselves at Covent Garden. Because it was a nice night, we sat outside and were chatting away about our day, when I was approached from behind by a man with a bunch of papers who began waving them in front of me and rambling about something. Thinking he was just trying to sell something, we waved him away and our waiter approached to tell him to stop harassing us. He then took off like a shot. I never even saw his face. About 45 minutes later when Ian I got up to leave, I discovered my iPhone was missing, and then that’s when I realized what had happened. I’d fallen for the oldest scam ever. While the gypsy man was shoving papers in front of my face, he was swiping my iPhone off the table. As dumb as I feel, I wonder if he understood how locked down that thing is. I blocked it immediately and AT&T said it will be virtually useless to him. The restaurant management was very upset (yeah, right) and escorted us to Covent Garden Security, and then the Security people were upset about it (sure) and pointed us in the direction of the Police station and implored us to file a report. At that point, I knew the phone was long gone and I would never see it again. My heart wasn’t really into reporting it, I just wanted to go home, but Ian convinced me it was the right thing to do to report it, so we headed to the station. At the front door of the Police station, however, a handwritten note told us that the station was closed due to power cuts. We ran into a “bobby”, that’s a “cop” in the UK, who was extremely sympathetic, and then told us we could report the crime online. Which we did. And the extra walking around to the police station, etc. helped me break my all time tally of steps recorded in a single day on my Jawbone UP24: 20,000 steps or over 7 miles! And, I have to say, the metropolitan police have followed up with some very pleasant phone calls and emails for a crime that has about .00000001% chance of ever being solved, which does make me feel better that they at least someone cares other than Ian and myself. And Ian was a total champ during the whole thing. He provided all the details to the security office at Covent Gardent, and then back at the flat took over filing the police report online. He was a huge help. And, as he always says, we’ll survive. Today was quite the adventure… We started our journey with a delicious caramel frappuccino at our local Starbucks conveniently located right next to the Earl’s Court tube station. 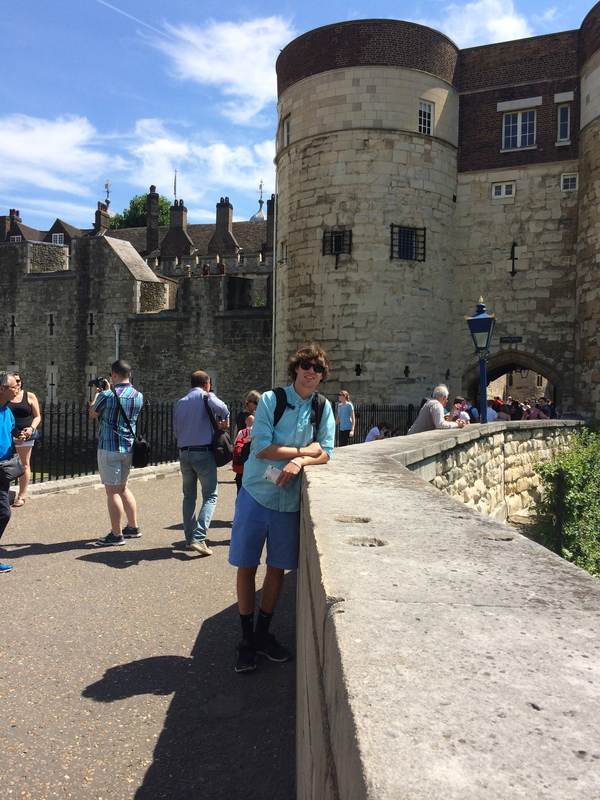 We soon arrived, after a short ride, at the Tower Hill station where we toured the Tower of London. It was packed full of history including the royal jewels and crowns of the some of the most important queens and kings. I was very much looking forward to the “Bloody” tower figuring there would be vast tales of prisoners, beheadings, and violence. We figured wrong 😦 but the tower was still really cool (and old)! Jane was on top of her game (so we thought)- we would tour the Tower and then meet the group for the historic pub walk at the station nearby.. This was a great plan but, like mentioned, the station was not the Tower Bridge station it was the London Bridge station which was 2 tube rides away. I was getting scared because on the second part of the ride it was already 14:05 (2:05). We hustled to get to the spot but sadly we hadn’t made it in time . I was thinking of things to do since the walking tour was 4 hours we would have a huge gap of free time and it wasn’t looking too good. This is when Jane put in her MVP performance. She clutched up and figured out we had to find the George Inn. I thought “well if she figured out the first pub then I should find how to get there” and that’s just what I did. Using the magical GPS I guided us through a part of London I saw for the first time and just like that we met out tour guide inside the historic pub. We visited 4 pubs that day and I thought each one was better than the next; the lagers had nothing to do with it I swear 😉 . Aunt suggested we head to Covent Garden for dinner and I thought that was a great idea because the last time we were there (our first day) I got to see a man in just his underpants juggle a chainsaw in front of a giant crowd. This time around was not as entertaining but had a decent meal out on the Piazza (plaza) until a freckled man came up to our table offering a bunch of flyers. After we both had sternly told the gypsy “No” it wasn’t until one of the waiters came up to shoo him away. The image of that bastards face will forever be burned into my memory and he ran off like a bat out of hell which, honestly, I kept thinking was kind of weird. Not until we were leaving did we realize he snatched Jane’s iPhone, but I did not think it would be the last I saw of it. Knowing the power of iOs7 and the iPhone, I went on the Where’s my iPhone? app on my phone and had Jane enter her apple ID and password. I barely had any wifi but it was locating…locating…locating until it said “offline”. This was extremely disappointing (Steve Jobs you’ve failed me) because you should be able to find the iPhone no matter what: offline, online, airplane mode, etc. After a frenzy of events I found myself back at the apartment on the London Met police site where I filed the crime report while Jane was dealing with AT&T. Here is where I’d like to apologize to my grandparents and parents for recording their home phone numbers on the report (I honestly put every number that could reach Jane or me) and my dear old grandparents received a call at 4 AM from them. It appears even jolly olde england has bastardos – but acknowledge and move on, you will survive…. and survive well! that’s right, aunt june! stand fast! Reggie, it was a true milestone. Jane and Ian, you are so on top of it all!!!! Love the blogs!!! Thanks, Aunt Micki! Wish you were here with us! What a grand adventure – makes me jealous. Good writing Ian. I think Covent Garden is where they stole my wallet when we were young – never go there again:) Some things nerve change. Glad to see how on top of your game you both are – – way to go on the steps! That’s right, Pam! I forgot about that. Was it at Punch and Judy’s?